I must admit, heading into The Bird and the Blade I had no idea what I was in for. The novel is a retelling of the tale of Prince Khalaf and the Princess of China and also the opera Turandot, neither of which was I familiar with beforehand and a fact I think I’m glad for because I personally like the unknown, especially when there are moments to surprise and shock me in store and that’s exactly what I found in this story. The story follows Jinghua, a slave in the thirteenth-century Mongol Empire and is told in two periods in time. The current time shows a Jinghua scouring the city for Prince Khalaf, trying to stop him from making what very well could be a fatal mistake. Prince Khalaf, as well as his father and what’s left of their people, are in trouble so Khalaf is willing to risk it all for a marriage alliance with the heir to the empire. But the Princess Turandokht is incredibly smart and quite devious and with no interest in marrying, she has set a challenge for her pursuers that they must answer 3 riddles in order to win her hand. Fail and you die. But before we can fully grasp the circumstances that brought the characters to this time we have to go back a year and see how the situation for the khan of Kipchak Khanate and his son the prince got so terribly dire, leading them to live on the run. And how Jinghua, a slave, ended up playing such a role in what’s to come. I love how the author set up the back and forth of the storytelling. We get these little snippets of what’s currently happening before we jump back in time to tell the bulk of the story and each really grabbed my attention. I needed to know how they got to that point yet I needed to know how it would end. Besides a slight lag in the middle (there’s a lot of traveling), I found this easy to read and I don’t think I expected that from the blurb. The characters were just so complex and overall amazing. Jinghua isn’t your typical fantasy heroine. She’s not super badass and strong yet at the same time that’s exactly what she becomes. Who I probably loved the best though was Timur, Khalaf’s father, which was a huge surprise to me. He’s an irritable, grumpy old man and he made me laugh over and over with his antics. I expected the Princess to play a larger role than she did. She was kept at an arm’s length so to speak and very mysterious and while I’m okay with that, I also wish we got to know more about her. 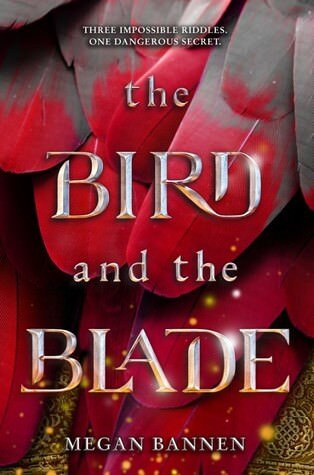 Since I was unfamiliar with the inspiration for The Bird and the Blade, I have to say the ending was not something I expected or saw coming and I loved the shock factor and the emotions it brought out of me. This truly is a love story in a way that is very different than my typical reads and that’s probably what I loved best about it. Definitely worth checking out! I reeeeeeally hope you enjoy this one! I’ll be on the lookout for your review! I’m not familiar with either of the stories the retelling is based on, but the story itself sounds wonderful. Jinghua and Timur both sounds like such great characters. It was all about the characters in this one! Great review! I was already excited for this book. When the reviews mentioned the inspirations, I started doing research. I’m hoping my heart will be okay. LOL. LOL I had no idea when I picked it up. I’d probably still have picked it up if I had known more and it really is well done so it’s all worth it!